President Cyril Ramaphosa has paid his respects to the South African soldiers who died 102 years ago when the military steamship, the SS Mendi sank during dense fog on the English Channel. More than 600 people died, of which many were black South African troops. A spectacular display by the country’s armed forces is being showcased at Blouberg Strand in Cape Town as part of National Armed Forces Day. President Ramaphosa has addressed the gathering saying the country honours the sacrifice of those who died. 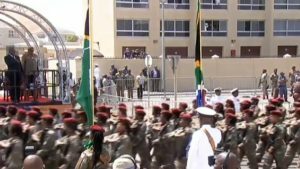 The post President Ramaphosa pays respects to SS Mendi soldiers appeared first on SABC News – Breaking news, special reports, world, business, sport coverage of all South African current events. Africa's news leader..